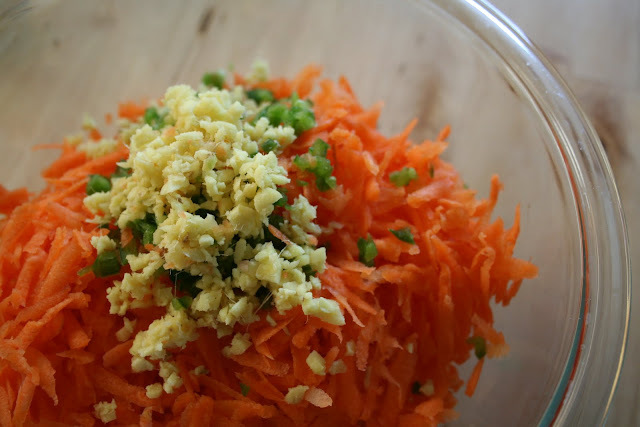 The Freerange Chick: Winter salad? It's the middle of March and the snow has transitioned to rain interspersed with days sunny enough to cause some people to break out their T-shirts. Yet, even as I can see the first signs of green emerging from the ground, it's going to be a while before typical salad greens will make their way to my mouth. 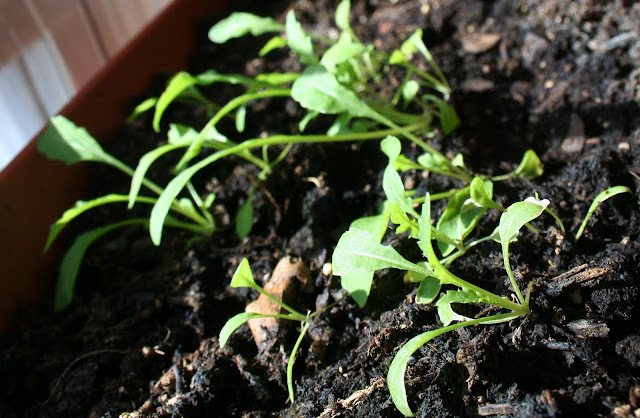 I started some arugula and spinach in my window box some time in December, but it's far from being ready for anything more than decorative micro greens. In the middle of summer, I was eating almost a head of lettuce a day from my CSA share. At that time, I thought I could go without salads for the rest of my life. I was wrong. I'm jonesin' for some fresh, green goodness!!! I'm not going to have greens right now, but that's okay, because what I really want is the cool, crisp, tang that I get from eating salads. There's no reason I can't do that with the winter vegetables in my fridge and root cellar. Inspired by the Indian dish, kosambari, I made my own version using no moong beans (although that was just that I didn't have them in my pantry) and carrots. I've also made this with a combination of carrots and parsnips. And I think it would also be lovely if I threw in some celeriac. Put all the vegetables in a medium bowl and mix with lime juice. 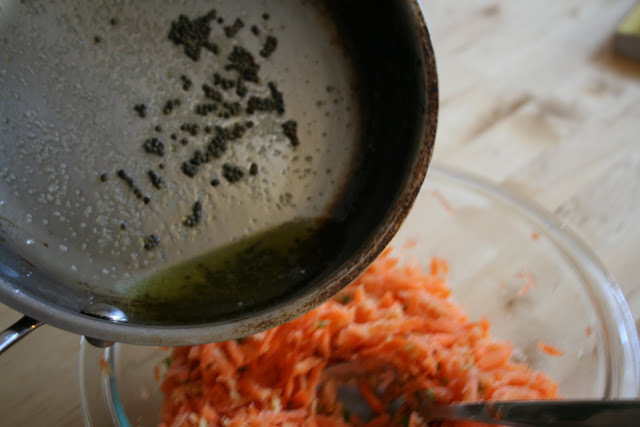 Heat the oil in a shallow pan over medium-high heat. When a drop of water will dance across the top of the oil, add the mustard seeds. Cover and saute until the popping of the seeds subsides. Remember to cover or you'll get mustard seeds all over your kitchen. When done, take off the heat and add a touch of asafoetida. Asafoetida is a classic Indian spice that will really push a good dish over the top to plate-licking great. HOWEVER, it's a stinky devil and will infuse your entire kitchen with its smell. I keep my container in a second container in the very tip-top of my cabinet. I got mine from a local Indian store, but have also seen it in Whole Foods. If you can't find it, this dish will work just fine without it. Pour the oil and spice mixture over the salad. Mix, taste, and salt to taste. Eat right away or refrigerate and eat when chilled. Unlike lettuce salads that wilt over time, this just gets better every day. It will last for about a week.